Each test typically contains at least 6 question impressions and 4 known impressions. Also, acetate overlays are provided as well. Each proficiency test participant will be issued a unique web code and password to access our easy answer submission portal. Once logged into the portal, you will be asked to complete a simple survey. This information will be used to create our Advanced Results Summary Report. When finished with the simple survey, you will then provide your test answers and comments. Test answers are entered using simple dropdown boxes which can be saved for a later submission or submited to RS&A. RS&A is committed to constantly improving and offering high quality forensic related products and services. Our commitment is especially important in the field of proficiency testing. We are keenly aware that the results of published Proficiency Testing Results can either be used properly, misused by naysayers of the impression evidence sciences, or sometimes even used as a tool for the defense bar to attack unsuspecting forensic identification specialists. We believe the most prevalent problem that has existed for much too long is the lack of pertinent data to accompany the raw proficiency test results. Without knowing about the test participant's credentials, experience, and their agency's processes when completing purchased proficiency tests, the published test results are worse than having none at all. It is only through a review of the test results, in relation to the information about the participant and their agency, that the published results can become accurate and truly representative. Therefore, before submitting your test answers, you will be required to complete a simple online survey. The data we have asked you to provide, in conjunction with the other participants, will enable RS&A to provide the forensic identification industry what they have needed for so long. Regardless of the results, we will know that the published data is not only accurate but truly meaningful. For those of you who prefer to save a few trees and a few bucks, you may now choose to receive your proficiency test via “Online Download”. This option not only eliminates the use of costly photo paper and DVDs, but it also eliminates shipping cost. Our cost saving allows us to pass cost savings on to you! HOW IT WORKS: Purchase your downloadable proficiency test and we will send you an email on distribution day with login credentials and download instructions. Simply, login to our secure download portal where you will find all the test materials required to complete your Footwear Comparison Proficiency Test. RS&A understands the unique finance and budget requirements of State and Federal Agencies. We offer flexible payment options to help make your proficiency test purchases easier. If you have unique changes or special needs, contact us and we will work out a custom solution to your unique problem. NOTE: International Bank Wire Transfer fees range from $50 USD to $75 USD depending on the country. For all orders paid using a Bank Wire Transfer payment method, the client will be charged a flat $50 USD banking fee. This fee is charged to RS&A by the bank for processing the international payment. Once your order has been submitted, you will receive an order confirmation email and an additional email which will contain an updated invoice cost and all the banking information necessary to complete your bank wire transfer. United States = Free Shipping! This sample document is for test demonstrations purposes only. 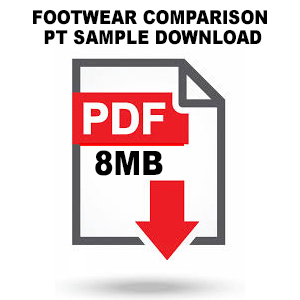 This sample document has been compressed for easy and quick online download. Images contained in the sample document are not comparison quality images and do not accuratley represent RS&A production test images. Reports and report data cotnained in the sample document are for demonstration purposes only. © 2002 , Ron Smith & Associates, Inc.